Emma Coburn will lead 500 runners for the inaugural Elk Run 5K on Saturday, September 30, 2017. 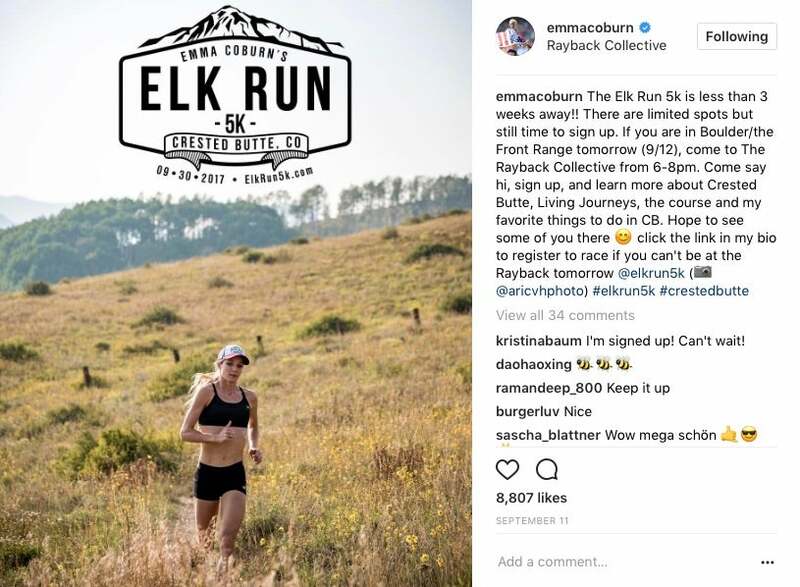 You read that headline right: Tomorrow morning, 500 people will run with World Champion and Olympian Emma Coburn along a sold-out 5K course in Crested Butte, Colo. The inaugural race, called the Elk Run 5K, was announced earlier this summer by Coburn herself, who created the race as a way to give back to her hometown. With registration capped at 500 (the town itself has an estimated population of less than 2,000), the Elk Run 5K sold out earlier this week, though Coburn continues encouraging interested parties to participate in the post-race celebration, which will include a performance by a local 80s cover band. “Throughout my career, even when I was running dirt tracks in middle school, the whole town was cheering for me,” Coburn said earlier this month as she was preparing to race the New Balance 5th Avenue Mile in New York City. “I wanted to create an event where I could connect with and give back to my community.” While Coburn will be on the route with all of the registered runners, she will personally pace one runner for the entirety of the 5K–all that lucky runner has to do is win the bidding war currently taking place for her pacing services. At our last check, that price had risen to $650, which will join the event’s total fundraising amount. The Elk Run 5K shows Coburn returning to her roots in more ways than one. In addition to encouraging community members of all ages to embrace healthy lifestyles and join her for tomorrow’s race, Coburn also selected the nonprofit Living Journeys as the beneficiary of the event’s fundraising efforts. Dedicated to providing support (financial and otherwise) to cancer patients, it’s an organization with which Coburn volunteered while in high school. Crested Butte is a small place, but if you happen to be in town tomorrow, we’d advise finding a place to spectate as Coburn leads the field of 500. To learn more about the Elk Run 5K, visit the official race website.